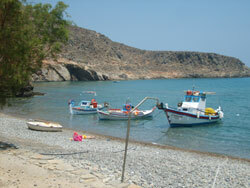 Kato Zakros, the easternmost village of Crete, is a tranquil, small place with a pleasant beach. 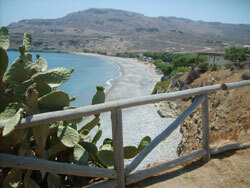 It’s also tiny, comprising a dozen houses, of which half are tavernas, all clustered next to the beach. The meals are good and cheap, on the whole. Unfortunately, the waiters harass passersby to eat in their establishment, which is inevitably ‘the best’! 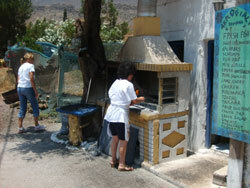 Some of the tavernas’ fish and meat dishes are grilled over an open fire. Most people come to Kato Zakros by car from Sitia. Fish is the speciality of most the tavernas here, possibly serviced by the small fishing boats standing on the beach nearby. 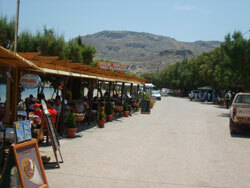 I ate in the biggest taverna (which also has a lot of shade), called Akrogiali; the food was excellent. Kato Zakros has a very nice beach, with the water shimmering many beautiful picture-perfect shades of blue. Almost all houses here rent simple rooms (prices start from €25 outside high season). Rooms can be tricky to find in August, and sometimes just plain unavailable. Most visitors just visit for the day, taking the bus or an excursion. These buses run only on Monday, Wendesday and Friday! 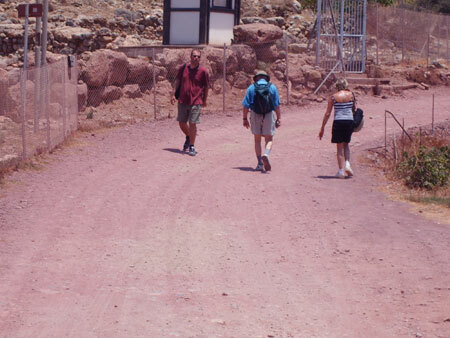 There are no buses or any other public transport to Xerokambos. 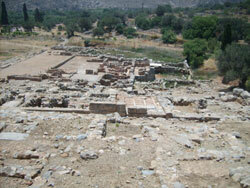 The big tourist attraction of the Zakros area is undoubtedly the Minoan Palace of Zakros. 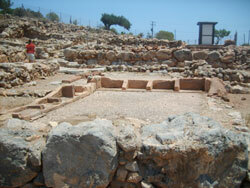 Alongside Knossos, Malia and Phaistos it’s one of the most important Minoan sites in Crete. Unlike the other three, Zakros was never plundered or despoiled, so there’s plenty to look at, even if it is significantly smaller than the other palaces. The findings - especially the earthenware pottery - of the archeological team were mostly shipped of to the Archeological Museum of Iraklio. To the archeological amateur the actual site may not be that interesting – there are a lot of stones and some walls. But a little imagination should bring the scene to life. 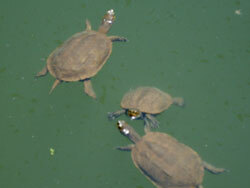 There are some interesting fountains where turtles (European Pont Terrapin) live. The palace has plenty of water, evidenced by springs. Possibly the strangest thing to note round here is the purple soil in this area. If you’re interested, it’s best to read a book before visiting, or hire a guide. In the 2019 the entrance will be around €3 to 4. The small town of Zakros (pop. 1000) is roughly 5km from Kato Zakros. It’s a mountain village whose inhabitants mostly make their living with agriculture. There’s a big hotel in the centre, which also has a kafenion and a bar. It’s a very old-fashioned village, which feels twenty years behind the coastal towns. Anyone who has time should try a night here; in May 2018 doubles were as low as €25, including breakfast.